This lesson will demonstrate how to create a field that displays placeholder text when the field is a) empty and b) does not have focus. If you are not familiar with how to assign behaviors then please see How to Assign a Behavior. The behavior I will show you will display placeholder text in a field when the field is empty and does not have focus. The field will be light gray. When the field has focus the placeholder text will disappear and the text color will be inherited (usually black). 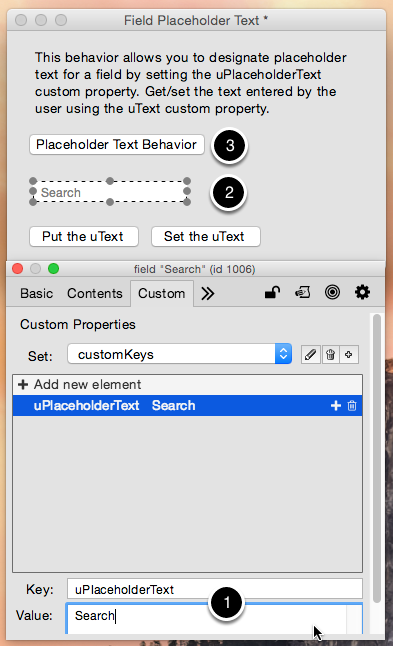 You assign the placeholder text by setting the uPlaceholderText custom property (1) of the field (2). The behavior (3) will display this text when appropriate. You must get and set the text of the field using the uText or uUTF8Text custom properties that are defined in the behavior. These custom properties only return a value if the user has entered some text. They won't return the text if the placeholder is being displayed. set the uText of field "Field" to "Some Text"
put the uText of field "Field"
This is the script of the behavior. In the example stack it is stored in the Placeholder Text Behavior button. ## Am I focused? If so then don't do anything. Next: How do I Create and set up a Database? set the text of me to ""
@Scott - But what happens if the user doesn't type any text and then leaves the field? You're prompt is gone. Also, the text color of the prompt text is usually lighter than the text the user types in. I use the following code and works well for me. set the text of me to "Search"
set the foregroundColor of me to "125,125,125"
@Jan - you would also want to handle the closeField message. In addition, the behavior adds a property (uText) which will return empty if the user hasn't typed any text but the placeholder text is visible. With your solution you would need to make a decision when getting the text of the field as to whether or not the text entered was by the user or your prompt. perhaps I don't understand you [I'm Dutch;-)], but when the user enters the field the placeholder text disappears. When the user types some text in the field the color of the text is black (in my case) and only that text is visible. Which means the user typed in some text. I agree that you need a closeField message as well, for example when the user typed in some text and then deleted it and tabbed to another field. But as far as I know there is no misunderstanding whether the text was entered by the user or it was the prompt. If the prompt text is still visible (e.g. the user never typed anything or the user typed something but then later deleted what they entered and the prompt text reappeared) then the variable theUserEnteredText will be empty rather than "Search". What would your code look like that gets the text of the field? Also, in your code, what if the user typed in "Search", left the field and then came back to it? The text they typed would disappear. So while your example works in a very basic sense, it requires more code elsewhere and can break during user interaction. @Trevor - Oops, I think you're right. Thanks for your explanation. It helps me a lot! Is there something in the method described in the lesson that is not working for you? Trevor was the original author of the lesson so this is the method he would use, but if it is not working or you are looking for some slightly modified behavior please let us know. Has anyone made a placeholder behavior where the placeholder text dims when the field has focus and only goes away when the user enters text or pastes? You could add a new handler, or modify _ClearDefaultText, to check the text in the field. If it is the default text then dim the text, otherwise set the text color to empty(the default color). The downside of this is that the default text is never automatically cleared.